RAM, the American truck brand that launched this year in New Zealand with the RAM 2500 and 3500 trucks, is going European with its first ever display in World’s largest commercial vehicle motor show, the IAA Commercial Vehicle Show in Germany this week (21-29 September 2016). The IAA Commercial Vehicle Show in Hannover is the world’s leading trade fair for mobility, transportation, and logistics for commercial vehicles and RAM’s debut at the show marks a major step in RAM’s expansion into global markets. The inaugural display will feature a Ram 1500 Quad Cab Sport with a 5.7-liter HEMI petrol engine and an eight-speed automatic transmission. The Bright White Ram has been adapted for use with liquid petroleum gas (LPG), a popular option in Europe, which delivers increased fuel economy and extended-range driving capabilities. The system allows the driver to switch between LPG and petrol on the move. 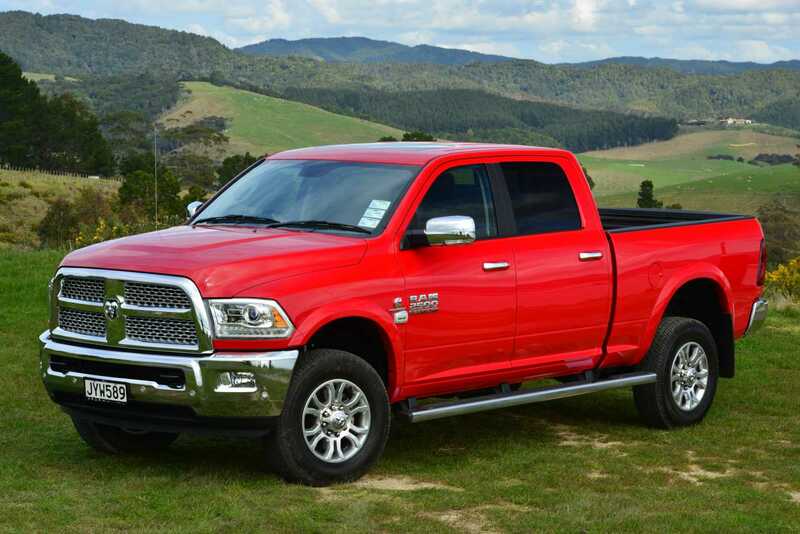 Here in New Zealand, the RAM 2500 and 3500 are powered by a 6.7 litre Cummins turbo diesel engine producing 276 kW and a staggering 1084 Nm of torque, a RAM Truck can carry or tow an astounding amount. Depending on the type of towing arrangement utilised, RAM Trucks feature an enormous towing capacity of up to 6989 kg for the RAM 2500 and an impressive 6170 kg for the RAM 3500. Payload is 913 kg for the RAM 2500 and 1713 kg for the RAM 3500. All that power and weight is fed to the road via a 68RFE six-speed automatic transmission, which includes driver-adaptive shifting and three multiple clutch packs, dual filters on a dual stage pump and an independent lubrication cooler that delivers ample pressures under all loads and driving conditions. RAM engineers had the toughest of jobs in mind when they developed the RAM 2500 and RAM 3500 heavy-duty, 50-KSI steel frame, providing for more structural support than ever. Eight separate cross members, hydro formed frame rails and fully boxed rear rails help add strength and stability, giving the 2500 and 3500 the support to tow bigger and work harder. The RAM 2500 front suspension features a unique three-link coil spring arrangement. The rear suspension boasts a class exclusive five link coil spring suspension featuring unique multi-rate coil springs and heavy duty fixed displacement twin tube shock absorbers, both of which are placed in an outboard position that optimises performance and minimises noise and vibration. The RAM 3500 is even tougher with Hotchkiss rear leaf spring suspension that delivers mighty towing and payload capability. A significantly larger stabiliser bar generates higher roll stiffness than past models and gives RAM 3500 Heavy Duty trucks more stability on the road—and off. The advanced three-link front suspension on RAM 3500 increases roll stiffness and supports its increased towing capacity. The transfer case in the RAM is exactly what you need for an ultra-tough 4×4 capability. The BorgWarner BW 44-46 transfer case features responsive electronic shift on the fly engineering with three operating ranges plus neutral. This impressive unit offers a low range reduction ratio of 2.64:1 – an ideal ratio when off road in a slow rock climbing situation or when using your RAM 4×4 on challenging terrain or steep grades. RAM trucks are also big on safety and security featuring advanced, multi-stage front airbags, front and rear seat curtain airbags, electronic stability control, rear park assist and rear view camera, an eye level brake light with cargo camera, a tyre pressure monitoring system and remote keyless entry. American Special Vehicles is a venture combining the resources of Australasia’s largest independent automotive importer and distributor, the New Zealand owned Ateco Automotive, with the legendary Walkinshaw Automotive Group. RAM is the fastest growing truck brand in the United States. Since its launch as a stand-alone division of Fiat Chrysler Automobiles (FCA) in 2009, the RAM Truck brand has steadily emerged as an industry leader with US sales of more than 40,000 trucks per month. The American Special Vehicles RAM trucks are produced with Australian full volume import approval, meaning they are fully compliant with Australian Design Rules. The RAM trucks are imported to Australia direct from the factory in left hand drive. The Walkinshaw Automotive Group then completely remanufacture the RAM vehicles to right-hand drive on a purpose-built production line in Melbourne. Right-hand drive RAM trucks engineered by American Special Vehicles are covered by a comprehensive three year, 100,000 km warranty along with full parts and service support. Further information in regard to model range, specification, pricing and the RAM dealer network is available at www.ramtrucks.co.nz .